Ten times more powerful than the atomic bomb over Hiroshima. So violent was the amount of energy that was sparked when a so-called 'fireball' which is the name for a very bright meteor exploded about 26 kilometers above the Beringhavet by the Alaska 18. december of last year. 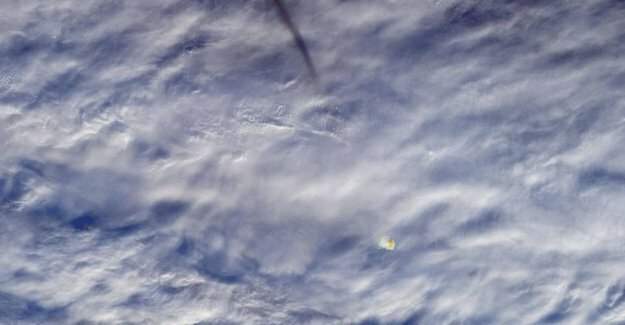 Pictures of meteorens legacy was intercepted a few minutes after the explosion of Nasa's 'Terra'satellite, and these images were published by Nasa's Jet Propulsion Laboratory on Friday. NASA estimates the explosion triggered the whole 173 kilotons of energy. Hence it is the strongest fireball, which has been observed since 2013.
the Jet Propulsion Laboratory, indicating in connection with the publication of the images is that, in spite of the violent power was never a danger that something would happen with someone on the ground. They report, also, that the so-called fireballs actually occur quite often, but rarely of this magnitude. Every time a fireball is observed, documenting the NASA it in a database, which can be found here. The database has data dating back from the 15. april 1988 and up to today.